This is about as simple thai food recipes as possible. It uses the spicy sweet chili or plum sauce normally used as spring roll dipping sauce as a glaze and marinade for roast duck! The sauce is perfect to give it a sweet/spicy glaze, and duck is the perfect meat to glaze since the fat crisps up on the outside when glazed and the spice cuts through the fatty taste. 1. 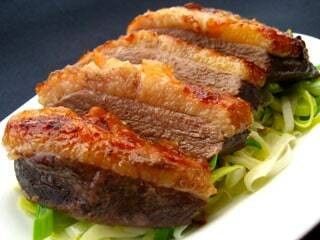 Clean the duck breast and prick the skin with a fork. 2. Pour over the sauce and sprinkle with salt, marinade for a couple of hours then roast in a medium (190 degrees) oven till it’s cooked the way you like it. 3. Optionally, it looks nice on a bed of fried leeks. Slice the leaks finely, and fry in butter lightly with a little salt.